A mother polar bear makes here way up a hill in the Churchill Management Wildlife Area in Hudson Bay in Churchill, Manitoba with her cub following closely behind. This tight knit family will travel across the icy tundra in search of food while the mother teaches her cub some important lessons. 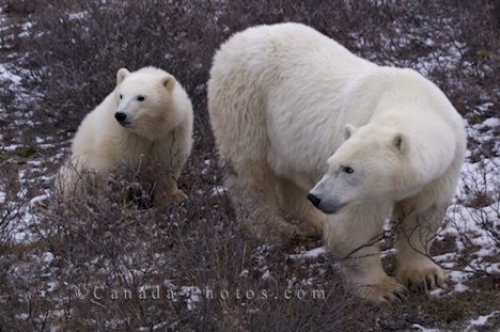 Picture of a Polar Bear family in the Churchill Wildlife Management Area in Churchill, Manitoba in Canada.